Journal Reference: Jackson R, S Collis, V Louf, A Protat, and L Majewski. 2018. "A 17 year climatology of convective cloud top heights in Darwin." Atmospheric Chemistry and Physics, 18(23), 10.5194/acp-2018-408. The normalized frequency of occurrence of echo top heights > 7 km in differing phases of the MJO and times of day. Only time periods in the break phase of the monsoon are used to generate this figure. 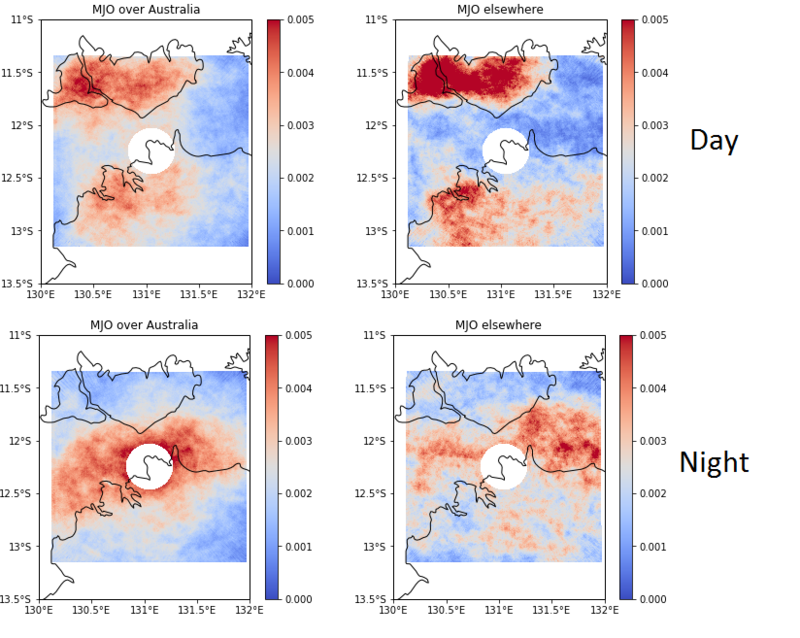 The meteorology in Darwin, Australia, is influenced by two major phenomena: the Indo-Australian Monsoon and the Madden-Julian Oscillation (MJO). The monsoon is driven by deep westerly winds that provide moisture flow over Darwin while the MJO is a disturbance that travels from the Indian Ocean to the Western Pacific in 30- to 60-day periods. 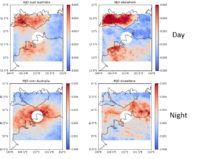 In this study, a 17-year climatology of the macrophysical characteristics of clouds estimated from research weather radar data in the Darwin region of Australia was analyzed for differing phases of the monsoon and MJO. This is the first time such a long-term data set of cloud macrophysical properties was ever analyzed in Darwin. This showed that the MJO is as least as important as the monsoon in determining the macrophysical properties of convection such as echo top height and convective cell area in Darwin. This is significant as previous studies did not examine how these vary in different phases of the MJO. Furthermore, this provides statistical observational targets for convective processes in earth system models. Echo top heights (ETHs), convective areas, and frequencies of mesoscale convective systems (MCSs) from 17 years of data from C-band POLarization (CPOL) Radar are analyzed in varying phases of the Madden-Julian Oscillation (MJO) and Northern Australian Monsoon. Bimodal distributions of ETH, likely attributable to the cumulus congestus and mature stages of convection, are more commonly observed when the active phase of the MJO is over Australia due to greater mid-level moisture. A stable layer at around 5-km altitude over Darwin can explain the position of the modes at around 2 to 4 km and 7 to 9 km respectively. Larger cells were observed during break conditions compared to monsoon conditions, but only during the inactive phase of the MJO. Hector, a deep convective system that occurs almost daily during the break season.